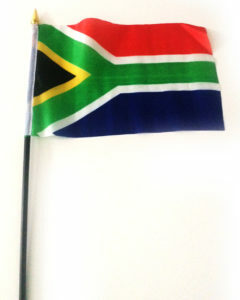 Home › SA Flag › Where can I buy South African Flags in Durban? Where can I buy South African Flags in Durban? You c an buy SA Flags from Bannerxpert in Durban. We stock Handheld Flags, Supporter Flags and the Standard Flags for the indoor and outdoor poles. Both the Flag for the pole and supporter flag are 1.2×1.8m. The supporter Flag does not have a toggle and rope unlike the pole flag. The supporter Flag is a preferred favourite for sport matches and marches as it is much cheaper. We also supply indoor and outdoor poles. Installation strictly in the Durban area.